The tradition of a ladies luncheon dates back to my childhood when once a year, it would be my mother's turn to host the bridge club. I think the ladies always had the same luncheon -- chicken salad! 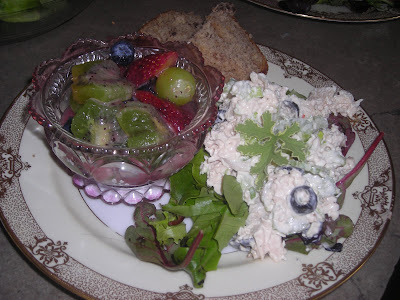 I don't think all of the ladies had the exact same chicken salad nor the exact same side dishes although the meal always seemed to include a fruit salad and a bread as well as the chicken salad. Desserts were where the ladies showed their culinary skills for they were often over the top! I love having ladies at Linderhof for a luncheon. It if is only 4, we eat in the breakfast room overlooking the garden. If it's more, we serve them in the dining room. For memories, I love the chicken salad/fruit salad plate. A muffin, a savory madeline or my favorite -- banana bread accompanies the salad. 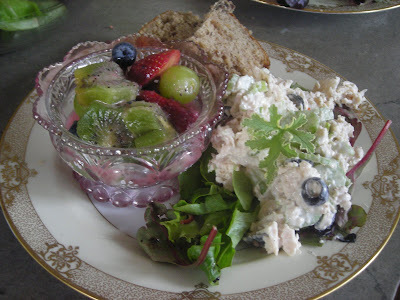 I have my favorite chicken salad which is an adaptation of my mother's and which I call Linderhof's Chicken Salad, but I am always eager to try new recipes. A favorite place in the city is the Nelson Gallery. A much beloved place from childhood on, I was thrilled when they put a roof on Rozelle Court and created the most European of dining spots outside of the Continent. 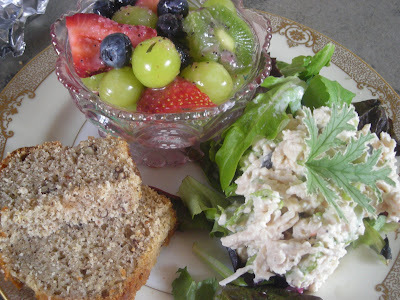 Their chicken salad is a favorite and I was lucky enough to receive the recipe. It does have a "secret" ingredient which is what makes it so special. The ladies had a grand time and the afternoon passed all too quickly. Unlike my mother's luncheons, there was no bridge involved. Just good food and good conversation. Mix mayonnaise, sour cream, sweet chili sauce, salt and pepper in a large mixing bowl. Add shredded chicken and mix well. Taste and adjust seasonings. NOTE: You can find the chili sauce in the Asian Market --it's from Thailand and called Maeploy. NOTE: This makes a ton of chicken salad and I usually halve the recipe when I make it and it still makes a lot. What a lovely plate - with the most appealing luncheon menu! I grew up with a mom who served this same kind of fare at ladies bridge club gatherings. Pretty hard to improve on your combination of food. It must be a treat to be a guest at your house. Your post is ALWAYS delightful. The recipe sounds delicious....ALL of your recipes sounds delicious. I had to print the apple tart recipe immediately. Can't wait to try it! I'll really been enjoying your blog and looking at all the lovely pictures. Your home is beautiful! Sounds like you and your DH are on the same page, which makes home resotration and decorating more fun! So glad you came over and said "Hi". I know we are kindered spirits! Sweet chili sauce?? Who knew? Thank you for sharing, the chicken salad does look pretty darned amazing! Sometimes a girly lunch just hits the spot! This one looks delicious! Martha, do you remember how the lunch ladies would get dressed up for their outing? The salad sounds delicious. Hi Martha! I think we've 'met' before on the Victoria website. (I'm from El Do, MO, now living in Virginia). I LOVE your blog and your home. Keep up the good work. I love chicken salad, I'll have to give it a try. Your plating always looks so refined and...delicious! We have met before at Victoria -- welcome to Linderhof. Mary -- oh, yes, stockings, heels, the best dress, a hat to match or coordinate and gloves -- always those gloves and my mother wore red red lipstick and I remember sitting on her bed watching her get ready at her dressing table!